The Shri Radha Krishna Mandir was founded in February, 1998 and its title registered in March, 1998. Sunday morning services were originally held in a garage at 135-28 128th Street, Wakefield, NY for the first 14 months. The current building (at 126-04 133rd Avenue, South Ozone Park, NY) was purchased on April 30, 1999. The Mandir opened its doors to the public at its current location in August, 1999 on Shri Krishna Janamasthmi. Due to the growing congregation, the Mandir was extended 25 feet towards the rear (which currently holds the altar) in 2005. Pandit Ramu is the Mandir’s regular officiating pandit. Regular service is held at the Mandir every Sunday from 10:00am to 12:00noon. Yajnas are held several times throughout the year to commemorate important festivals. 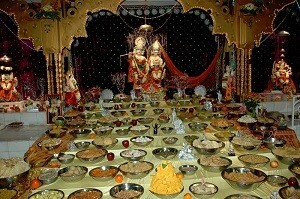 Special pujas are also held in observance of various important dates (such as Purnima).